The new build and release engine that ships with Visual Studio Team Services and Team Foundation Server 2015 (The Release Management bits shipped with TFS 2015 update 2) provides a whole new way of configuring your Continuous Integration and Deployment pipeline. A much improved and simplified way. You may have invested in the build and release features of previous versions, or you may be treading into uncharted (or currently not yet supported) territory for your own applications. That territory isn’t a swamp nor is it a desert; it’s actually not that hard once you know where to start. Let this article be your guide along the way. The existing build and release library of tasks is already quite extensive and consists of a set of predefined tasks that you can use to author your build and release pipelines. The tasks are divided into five categories: Build, Utility, Test, Package and Deploy. You have total freedom in choosing which ones you want to use and in what order. Most of the tasks come with a simple configuration UI, which allows you to tune their behavior. If your build process is relatively simple, you will probably not need to extend the process at all. You will only need to pick the right tasks from the library, put them in the right order and configure them. The Build category contains tasks that allow you to run a number of standard build and package management tools, ranging from MSBuild, NPM, Gradle, Grunt to Ant and Gulp. The Utility category contains tasks that allow you to run PowerShell and Batch scripts on Windows as well as Shell scripts on other platforms. The Deploy category contains a number of tasks that allow you to interact with remote machines, including Azure PowerShell, Docker and Chef. The common element of all of these tasks is the fact that they execute scripts that you’ve included in your source control repository. This has the advantage that it’s easy to version these scripts with your code, but it also introduces a coupling between your build pipeline and the scripts in source control. Given that their contents are not visible when looking at the pipeline, they can also make the build and release process harder to understand. However, what’s nice about these extension points is that you can use the technologies you are already familiar with to extend your build pipeline. It also allows you to port over your existing build pipeline without too much trouble. Tip: In order to quickly iterate while writing your script in the context of the Build system, you’ll find the Run Inline Power Shell and the Shell++ task very useful. They allow you to run a script defined completely in the task UI. However, after you’ve debugged your script, it is recommended to check it in and use the existing PowerShell and Shell Script tasks to run them. If you don’t have an existing script that does what you want, and writing such a script isn’t an easy thing to do, you should check out the Visual Studio Market Place to see if there is an existing extension that offers the functionality you’re after. Extensions are installed into your Visual Studio Team Services account of Team foundation Server (requires 2015 update 2 or higher). Extensions can carry one or more build tasks as well as other types of extensions, such as Dashboard Widgets or 3rd party features. Tip: You may also find an extension which provides most of the features you need. Since most extensions are released as Open Source, they may provide a starting point to build your own extension, or you may be able to provide the added functionality in the form of a pull request or raise an issue with the developer on their GitHub account. 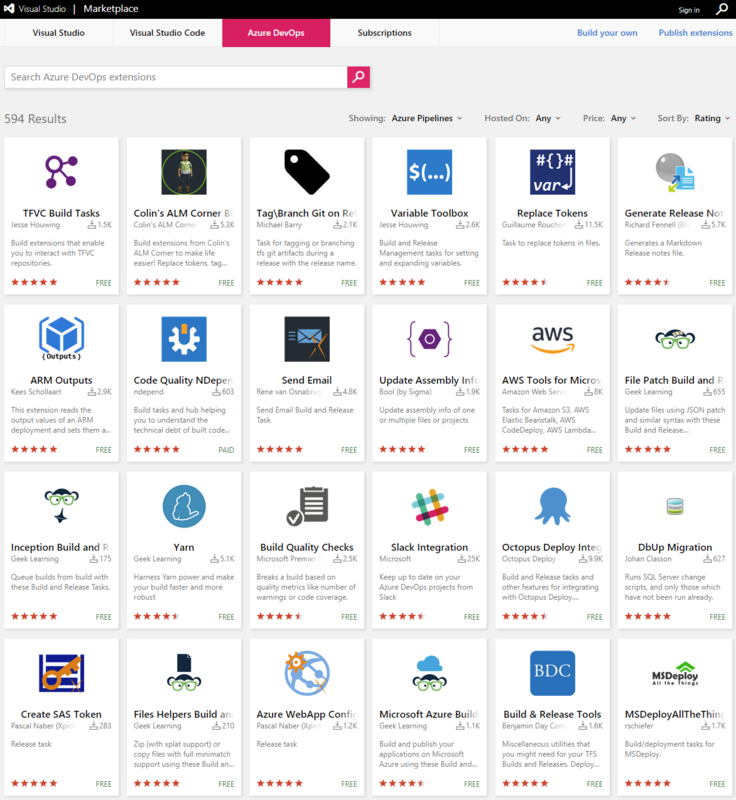 There are over 100 extensions in the Build and Release category of the Marketplace, so it is likely you will find what you are looking for. When you start making your scripts re-usable in different contexts, you will likely want to pass data into your scripts. There is a long list of pre-defined (well-known) variables available which you can reference directly from your existing build scripts through environment variables. It is highly recommended to use these well-known variables It is considered bad practice to rely on the availability of custom variables, as these will be hard to discover for other people. Instead, consider passing these values as arguments to your scripts. 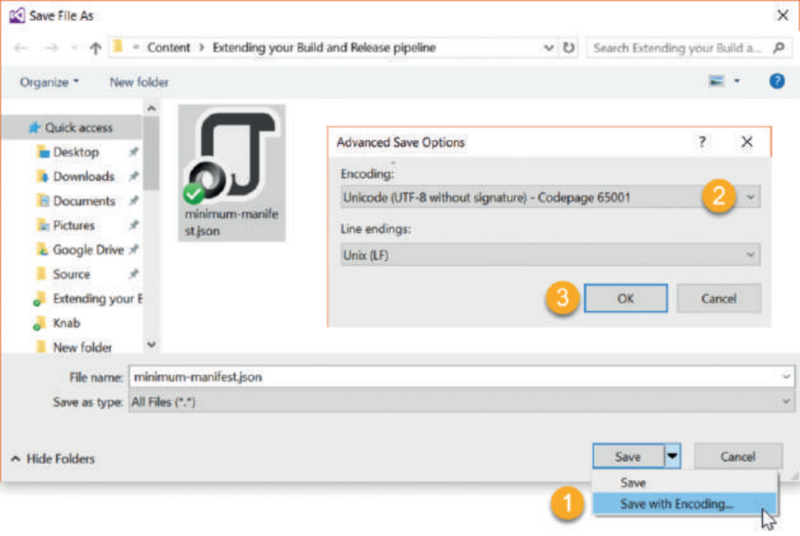 If you can’t find a task in the standard library nor an extension in the Marketplace to extend your Build and Release pipeline, you have the option of writing your own task. You may also want to wrap your existing scripts in a task to provide a nice UI user interface to make it easier for others to consume. task.json – The task manifest which describes the task’s input parameters and the main entry point. A .js or .ps1 file – The actual script that is executed as configured in the task.json. Tip: You can use the Cross Platform TFS Command line tool to create a skeleton task using tfx build tasks create. Write-Output "##vso[task.logissue type=error;]Could not reach $remotehost"
You will be prompted for a Personal Access Token when you are uploading to Team Services or for your account credentials for TFS (use Fiddler or an NTLM authentication proxy to authenticate against TFS 2015). The task will then be available for all users of the target account / project collection. $remotehost = Get-VstsInput -Name "RemoteHost"
Write-VstsTaskError "Could not reach $remotehost"
If your task depends on the presence of third party tools, you should either package them as part of your task or define a demand in your task.json. If you ship a third party component, validate that its license is permits redistribution. When using a demand, your task will signal the consumer to install the third party prerequisites on the build server. The Visual Studio Marketplace makes it easier to create tasks and to share them with the community. To share your build task as an extension, follow the steps outlined on MSDN . You can also use the Build and Release Tasks for Team Services Extensions to automate the build and release pipelines of your extensions. As you can see, the process of writing a simple build task is easy. Although the documentation is currently still evolving, there are enough examples available, by means of the standard tasks as well as tasks shared by the community. The fact that both the Build and Release functionality depends on the same task library makes investments in custom tasks even more useful. If you feel your tasks are useful to others, share them to the community by pushing them to GitHub and publishing them as an extension to the Visual Studio Marketplace. If you find gaps in existing extensions, join the effort by submitting issues, or better yet, submitting a pull request. This article was originally published as part of Xpirit Magazine 3.